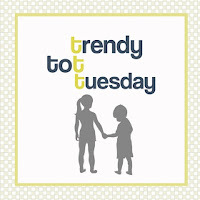 I am linking up with Kelly, Megan,and Lindsay for Trendy Tot Tuesday! I love dresses on little girls! Lily has mastered the art of playing in them. From the playground to birthday parties, my girls wear their fancy frocks, and nothing slows them down! Lexie picks most of her clothing now. While cute shirts, shorts, and skirts are starting to make an appearance in her wardrobe, she still chooses dresses more than half of the time! I didn't think Dylan would be participating this week! At 10:15, he was still fast asleep. Do the teenage years start at 8 these days?!? When he wakes up, he immediately dresses himself before coming out of his room. I was honestly shocked that he was wearing something other than athletic clothing today...well, other than the hat! If baby #4 is a girl, I found this cute little onesie and hat for her! If it's a boy, no big deal...it was inexpensive, and I can easily pass it on to a friend that IS having a girl! That onesie is super cute! I think it's so cute that they love wearing dresses. If I ever have a girl I think she'll live in dresses daily LOL! I need to take more pictures of my oldest's sons outfits and add them to the posts. It's hard getting pictures of him, but he dresses much like your son. He's obsessed with athletic gear. :) love the onsie, too! Sleeping in until 10:15am?!! So jealous! I looove that baby onesie and I especially looove the hat! Oh my goodness that first dress and the shoes are adorable! So cute! I hope all is well! Thank goodness it is not as hot and humid. Not sure how it is over by you, but just a few degrees can make all the difference. have a great day! That dress on Lily is so pretty! And under ten bucks, cannot beat it! I have got to get a Cotsco membership! I think I say that every week on your posts! I love that your girls want to wear dresses so much. Such sweet kids!